There is no such thing as too much data. In fact, teams increasingly collect all types of data to better engage users. The idea is simple: by collecting user data such as page views, site visits, clickthrough rates, event tracking, and other key events, marketing can better personalize content and more quickly identify sales-ready leads. To get the most out of marketing, teams collect as much data on users as possible to take action with targeted, relevant content. To create more sales opportunities, marketers increasingly use third-party platforms like Segment to collect, store, and route user information to hundreds of tools. Segment is tremendous at crunching all that lovely data collected on users and neatly sending it to the appropriate applications. 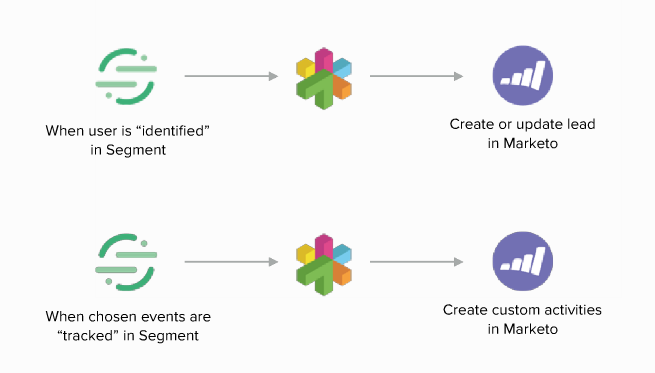 With just a few clicks, Segment both collects customer data *and* sends it to the appropriate place. Pretty cool. "easily and logically transform Segment’s firehose of data into a meaningful format Marketo can ingest"
We simply do not believe in a “one size fits all” approach to integrations. Your business is unique and your applications should reflect that. With tray, you now get the value of Segment into Marketo with *zero* dedicated engineering resources. We’ll handle the heavy lifting, like hosting, maintenance, and API versioning, so you can focus on customers.